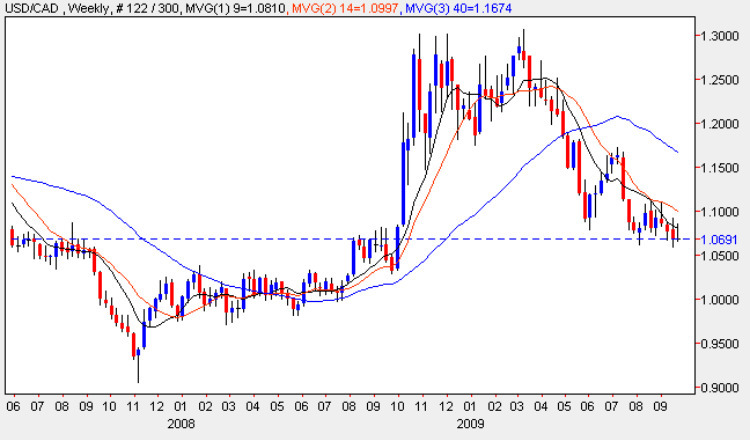 An interesting period for the usd to cad currency pair, which is now struggling to find some support in the 1.065 price level, before descending lower once again and back towards parity, a level last seen in August 2008. The weekly chart for the usd to cad pair, clearly shows the various technical levels which are now becoming increasingly important as the commodity currency desperately tries to re-base in the current level with a broad band of consolidation in the 1.05 to 1.06 region being the first on the horizon. Should this level failed to provide the required support, then the final level is that sitting just above the 1.02 region and should either of these levels be breached in the medium term then a much deeper move could be in prospect. Last week’s candle seemed to find a degree of support as the market closed with a narrow spread down bar and wick to both top and bottom, suggesting that the usd to cad is entering a period of indecision and sideways consolidation at the price level. However, with all three moving averages adding further downwards pressure, it will require a substantial change in US dollar sentiment for the pair to reverse higher with the necessary momentum to break back above and hold the 1.10 price level which is a key level for any trend reversal. Given the depth of the support in the 1.05 region, we may well see a period of consolidation at this level, and should US dollar sentiment change in the medium term, then this could provide the platform for a substantial trend reversal in due course. The main item of fundamental news on the economic calendar for today is, of course, the conclusion of the FOMC meeting in the US which may well set the tone for currency trading the usd to cad currency pari in the medium term, with any suggestion that rates may have to rise sooner rather than later, providing the much needed catalyst for investors and the markets to start buying US dollars once again!